Employees, employers and the government have all become very aware of the effects on health of the work environment. As a result, this subject area is rapidly developing with recent changes in legislation, sampling and measurement methods, as well as a new emphasis on the psychological impact of work, and the importance of an appropriate work-life balance. The purpose of this book is to provide a clear and concise account of the principles of occupational hygiene and, as such, it is suitable for students studying for degree courses in this subject and for the MFOM. It is also suitable for occupational physicians and nurses, to safety representatives and to trade unionists. This edition sees the introduction of nine new chapters covering recently emerged topics such as work/life balance, work organisation and pyschological issues. Dr Kerry Gardiner was the Acting Director of the Institute of Occupational Health, University of Birmingham, from mid-2000 to early 2003. He joined the Institute in 1987, having gained approximately a year's field experience as a consultant in London directly after graduating with a degree in Occupational Hygiene. His career at the IOH started as a Research Associate with specific responsibility for a large trans-European respiratory morbidity study; from which he gained his PhD. Despite a multitude of interests his particular area of research revolves around the use of exposure data in exposure-response analyses. Over time, he was appointed to a Lectureship, followed in 1997 by a Senior Lectureship. From March 2000 until April 2001, he was the President of the British Occupational Hygiene Society; during this term he spent his time ensuring that the Society contributed actively to Securing Health Together and trying to persuade other Learned/Professional Bodies to work actively together to address the essential tenet of disease/illness prevention. He is currently visiting Professor at the University of Witwatersrand, South Africa. Malcolm Harrington CBE, BSc, MSc, MD, FRCP, FFOM, is Emeritus Professor of Occupational Health at the University of Birmingham. Global Strategies and Trends in Occupational Health: Well-being at Work in Focus (Bengt Knave). Part 2: Organ Structure and Function and the Adverse Effects of Work. The Structure and Function if the Lung (J. Malcolm Harrington and Anthony J. Newman-Taylor). Organ Structure and Function: The Skin (Iain S. Foulds). The Effects of Inhaled Materials on the Lung and Other Target Organs (Jon G. Ayres). The Effects of Some Physical Agents (Philip Raffaelli). Toxicology (Julian Delic, Steven Fairburst and Maureen Meldreum). Part 3: Principles of Occupational Hygiene. The Nature and Properties of Workplace Airborne Contaminants (Lisa M. Brosseau and Claudiu T. Lungu). Principles of Risk Assessment (Steven S. Sadhra). Design of Exposure Measurement Surveys and their Statistical Analyses (Hans Krombout, Martie van Tongeren and Igor Burstyn). Retrospective Exposure Assessment (Tom J. Smith, Patricia A. Stewart and Robert F. Herrick). Part 4: Environmental Hazards: Principles and Methods of their Assessment. The Sampling of Aerosols: Principles and Methods. (David Mark). The Sampling of gases and Vapours: Principles and Methods (Richard H. Brown). Light and Lighting (N. Alan Smith). The Thermal Environment (Antony Youle). Non-ionizing Radiation: Electromagnetic Field and Optical Radiation (Philip Chadwick). Ionizing Radiation: Physics, Measurement, Biological Effects and Control (Ronald F. Clayton). Biological Agents (Julia M. Greig and Chris J. Ellis). The Development of Argonomics as a Scientific Discipline (Joanne Crawford). Dermal Exposure Assessment (John W. Cherrie)..
Part 5: Allied and Emerging Issues. Occupational Accident Prevention (Richard T. Booth and Anthony J. Boyle). Work Organization and Work-related Stress (Tom Cox, Amanda Griffiths and Stavroula Leka). Personal Protective Equipment (Robin M. Howie). 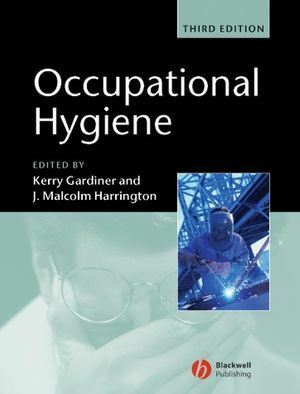 Set text for many occupational health and hygiene courses. Nine new chapters address recently emerged topics such as work/life balance, work organisation and psychological issues.